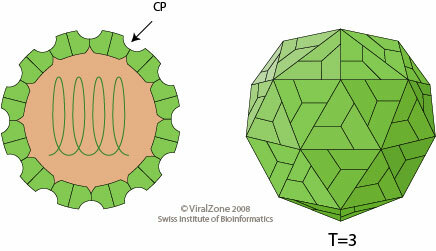 Non-enveloped, spherical, icosahedral, about 34 nm in diameter, capsid with a T=3 icosahedral symmetry. 30 hexameric capsomers per nucleocapsid (virion composed of 180 protein subunits). ETYMOLOGY Gallant: from "Gallant soldier", the vernacular English name of Galinsoga parviflora, the host of the type species of the genus. TROPISM Present in all parts of the plant. ASSOCIATED DISEASES chlorotic or necrotic local lesions, systemic mosaic; leaf malformation. TRANSMISSION Transmitted by mechanical inoculation; not transmitted by contact between plants; not transmitted by seeds.